Kershaw Blur; Crazy Clearance Prices! 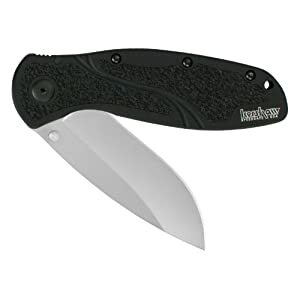 Kershaw has recently upgraded their popular (and excellent) Blur line of knives to use the newer, and also popular, S30V steel blades. The upgrade leaves a lot of older stock floating around though, and Amazon is selling the older silver, plain-edge versions for only $31! Sometimes when you order knives from Amazon, you don’t get the exact version described. In this case, you DO get to chose the blade style and color (I wish ALL their knife sales had that option). You don’t get to choose the exact steel though, so it’s a bit of a crap-shoot. At different points in time, Kershaw has made the Blur in 440A, 420HC, Sandvik 13C26N, and Sandvik 14C28N. Mine ended up being a 420HC version, but it really shouldn’t matter too much. All of those steels are solid mid-grade choices, and all are plenty good enough for an every day carry knife… especially one that only costs $31!